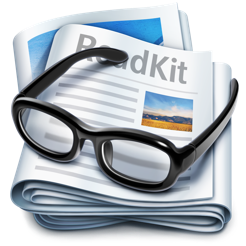 ReadKit is a full-featured read later and RSS client that supports services from Instapaper, Pocket, Pinboard, Feedly, Fever, NewsBlur, Feedbin and Feed Wrangler and has built-in RSS capabilities. 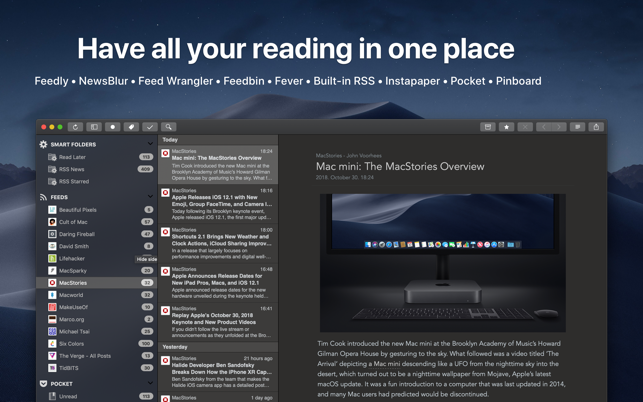 "If you use Feed Wrangler and have been looking for a desktop client, ReadKit is your best option"
"The best reading later app for the Mac now is a top-notch RSS reader, with native sync and support for Fever and NewsBlur"
"ReadKit is well-equipped to meet your newsreading needs"
"It’s my favorite way to use Feedly on the Mac now." 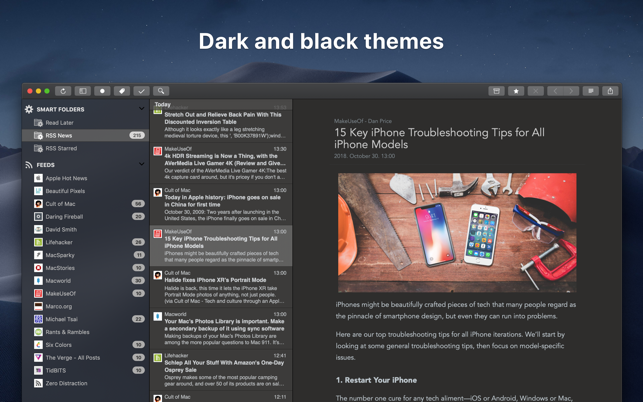 "If you're a news hound and own a Mac, ReadKit is absolutely worth adding to your dock." 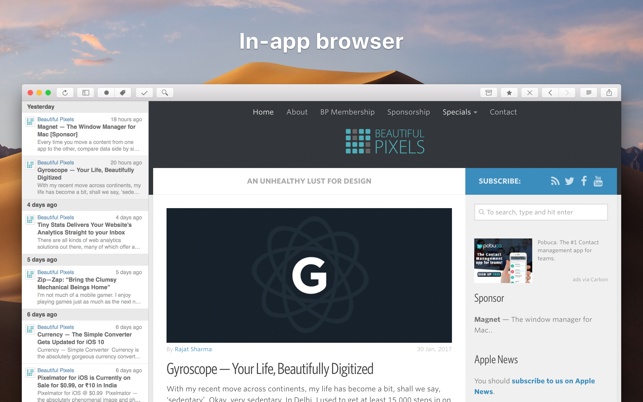 Have all your Instapaper, Pocket, Pinboard articles and Feedly, Fever, NewsBlur, Feedbin or Feed Wrangler RSS feeds in one convenient place even when you're offline. ReadKit has a built-in RSS engine too. This is an offline reader without syncing abilities. Subscribe either to RSS or Atom feeds, create and manage folders and import your existing subscriptions via OPML. Browse and manage your Pinboard bookmarks with ReadKit. In addition, you can download and store the contents of these bookmarks locally. 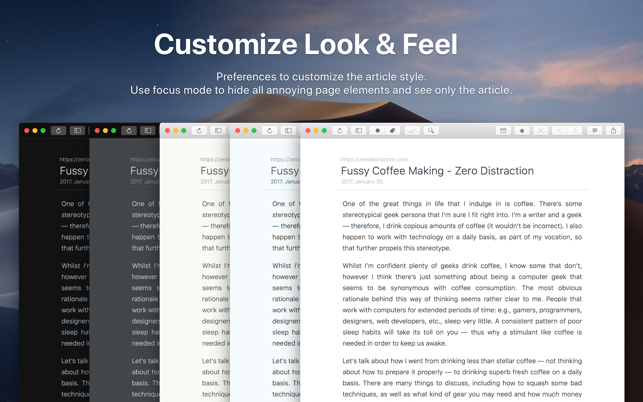 Choose the layout, formatting and style you prefer for reading, with the ability to move, add, archive and even mark your bookmarks as favorites. The interface is simple providing a straight forward reading experience without making any compromises. 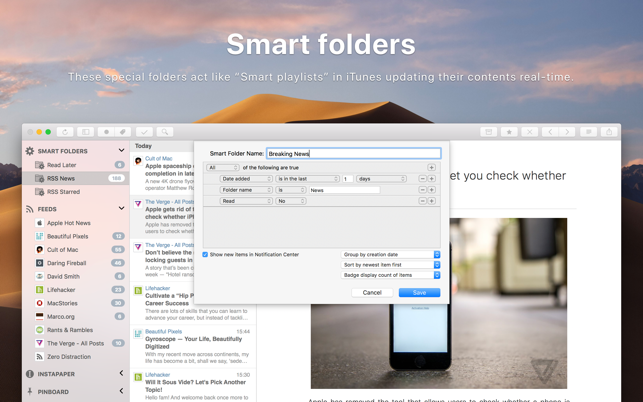 • Smart folders: can be used as unified folders but are more useful for everyone. These special folders act like “Smart playlists” in iTunes updating their contents real-time. Pinboard, Feedbin and Feed Wrangler users will need to have a premium subscription to use their account with ReadKit or any other 3rd party application. This app is all smoke and mirrors: the interface looks good but it's really clunky. 1) *The biggest problem here*: there is no “HELP” support whatsoever. After clicking on “help” from the toolbar, the app simply said: “There isn’t help available for ReadKit.” Well, that’s nice! 2) *second major problem*: you cannot easily import your OPM feeds from another service. I had been on the old NetNewsWire for a long time and was looking for a better alternative. However, ReadKit will not give me the option of importing my existing feeds from my previous service. The “import OPM” button is always dimmed and non-functional. 3) *Third problem*: even initiating any interaction with the app after installation is not intuitive. The first screen following the download says: “add your account.” What account? From what service? This app seems like it was designed by someone who has no social skills and thus cannot think from the end user's perspective. There is a terrible lack of foresight and plenty that screams "bad design"! So, what’s the point of this app, again? What are reviewers so excited about when they’re describing this app? I have no idea. You will pay $10 for a piece of clunky garbage. Save your money and find something free that actually works! I bought ReadKit in 2013 and it worked fine for years. However, a few months ago, it started crashing every time I used it. I have no idea what was causing the crashes. I sent crash reports and emails to the developer, but I never heard back. Now Readkit seems to be stable again. I have no idea what changed, but I’m glad it’s working again. When the app was crashing, I changed my rating to two stars. I’ve upped it back to four now that the app is working for me again. But, I didn’t give it a five-star rating because I’m disappointed that I never heard back from the developer when I was having problems. $5 one time? A steal. I usually use the Feedly browser app on Windows, and it’s always like a breath of fresh air to be back on a Mac, using ReadKit. Responsive and quick with great Instapaper access, I haven’t run into the errors others have reported in the reviews here. For a one-time purchase of $5, it’s silly not to try ReadKit if you spend any time reading your news with RSS.